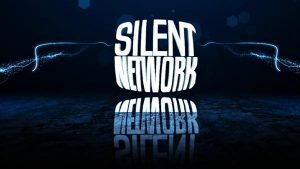 The Silent Network began in December of 1979 as the world’s only cable TV network for deaf, hard of hearing and hearing audiences. 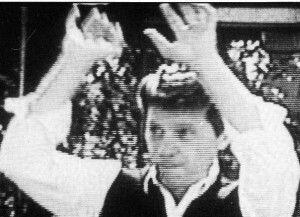 All of the programming was produced in sign language, subtitles and full sound. 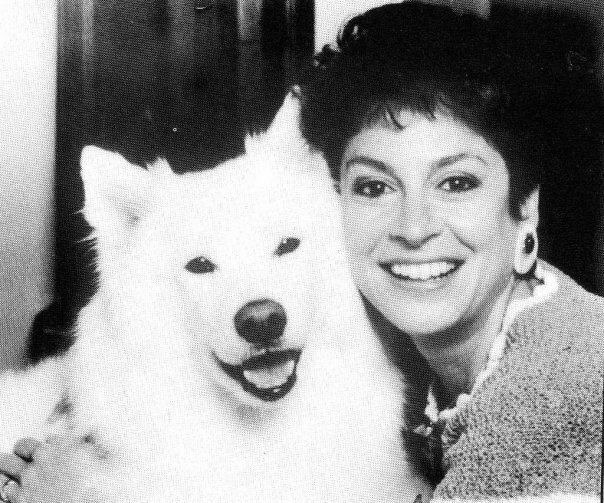 It was the brainchild of Kathleen Gold, mother of the actress, Julianne Gold, one of the stars of the Broadway production of “Children of a Lesser God,” and Sheldon I. Altfeld, an Emmy Award-winning writer, producer & director. 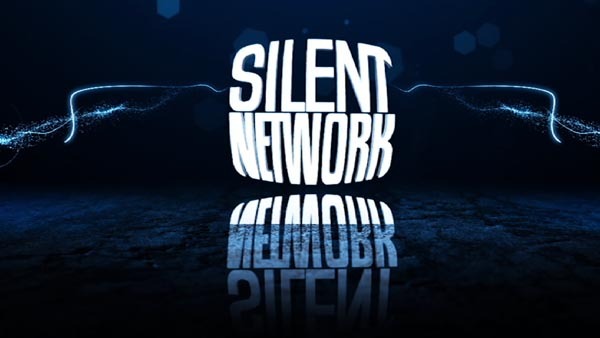 Over the 2 decades the network was on the air, it produced more than 3,000 programs, employed nearly 100 deaf people in a variety of capacities, and evolved from 2 million cable homes at its start to more than 17 million homes when the network shut down in 2000. 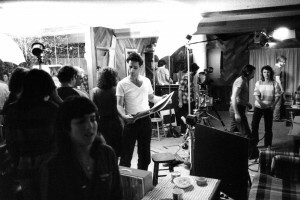 The photos on this page represent a thumbnail of activity that took place during the Network’s run on cable and serves as a “behind-the-scenes” snapshot of production in progress. 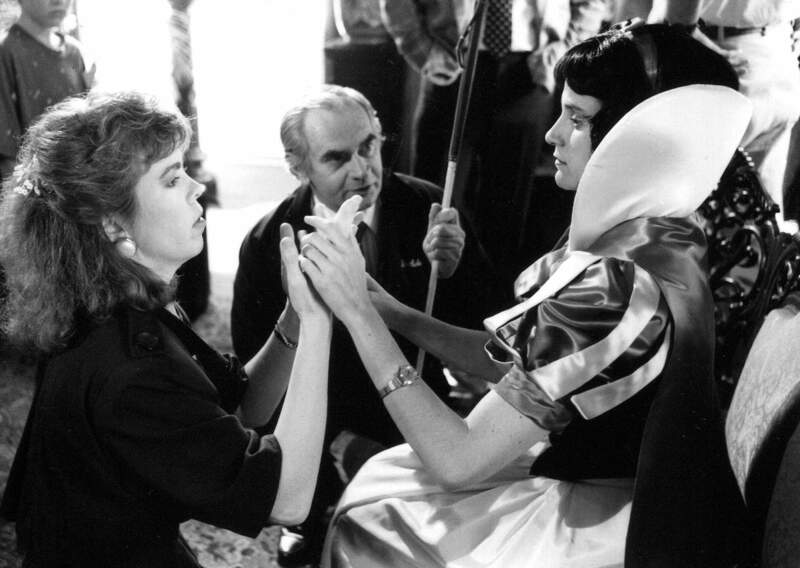 Deaf-Blind actress, Kim Powers (right), receives instructions from director, Sheldon I. Altfeld, through tactile interpreter Molly Sheridan during production of the award-winning series entitled “Kim’s World” which Altfeld produced and directed in 1991. 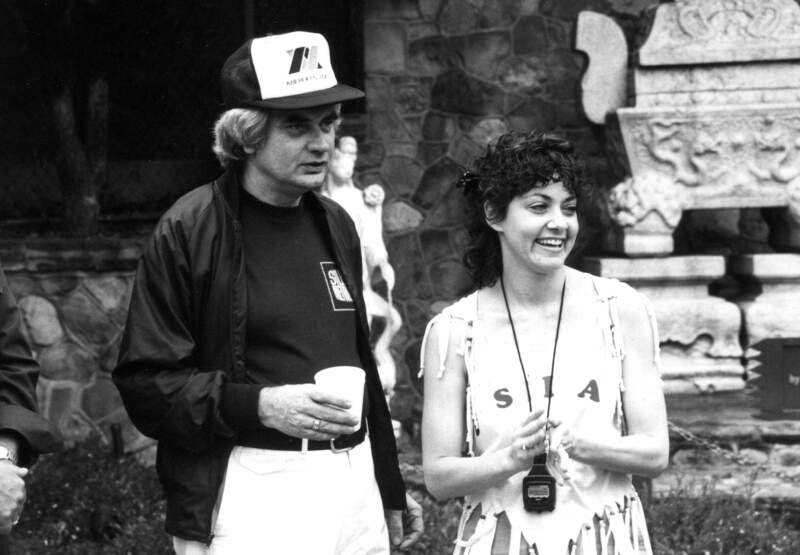 “Kim was one of the most natural talents I have ever worked with,” Altfeld stated. 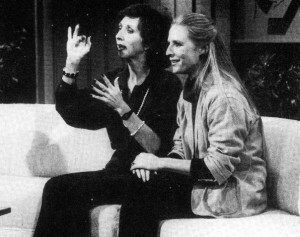 “And Molly was a perfect ‘co-star.’ I often refer to this series as one of my greatest achievements — considering that I had Kim ski down a mountain, scuba dive, stick her hand in an elephants mouth and perform many tasks that people would have said were impossible for a person who is both deaf and blind.” The series won the coveted Barbara Jordan Award presented by the President’s Committee for Persons With Disabilities, among other accolades. 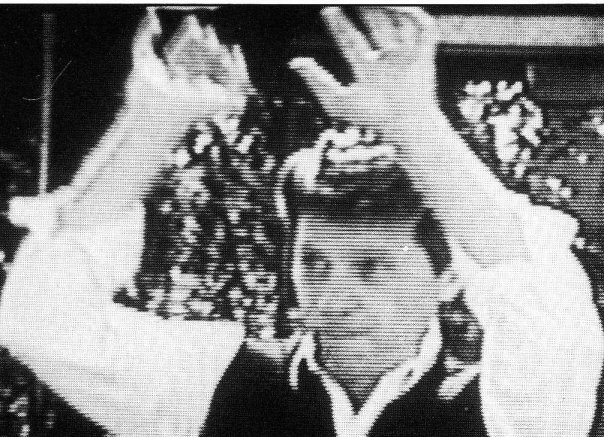 Call this “Organized Chaos.” Following the receipt of a $45,000 grant from Group W Cable in 1982, Executive Producer, Sheldon Altfeld set out to create as many programs as he could in as short a time as possible. So, for a total cost of $950 per episode and a crew of 12, they shot 47 half-hour programs, in three different locations, IN SIX DAYS — at the rate of eight shows a day — integrating music, titles and captions live on-set, with no post production necessary. Needless to say, the crew didn’t speak to Altfeld for several weeks after that. 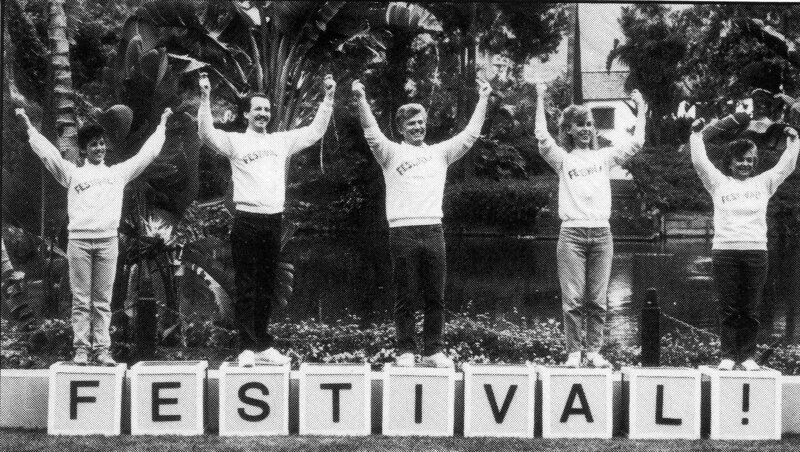 Among those seen in the picture are Scott Berg, Mike Stone, Laura B. Ripplinger and Kevin D Mills. FROM SILENT NETWORK TO NAD PRESIDENT! 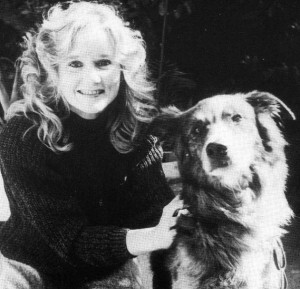 Actress Bobbie Beth Scoggins, with an unidentified mutt, co-star in the series “A Partnership With Man.” Bobbie went on to become President of the National Association of the Deaf. 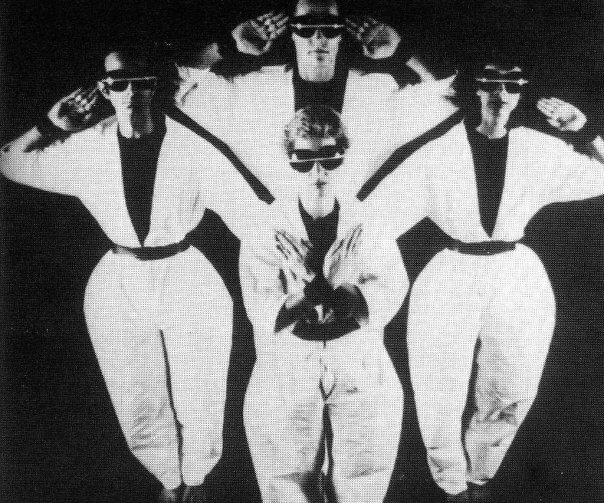 The internationally famous deaf dance troupe, MUSIGN, featuring Bob Hiltermann, Rita Corey, Ed Chevy and Marjorie Tanzar, appear in their only TV series, self-titled “Musign,” which was hosted by talented deaf performer Bob Daniels. Host Dean Sheridan and dog trainer Doreen James co-star in the unique Silent Network series, “Hear Dog,” which provided instruction on how deaf people can train their own dogs to become Hearing Ear Dogs. Aerobics instructor Pam Larson, the hearing daughter of Herb Larson. star of the Silent Network series, “Off-Hand,” is featured in the series “Aerobisign.” During a marathon taping schedule, she actually recorded eight half-hours on one day and five the next to complete the 13 episode series. After having exercised non-stop for a day and a half, she was carried her out on a stretcher. 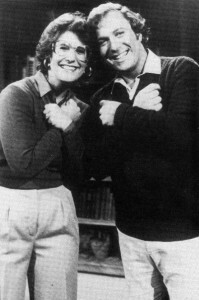 The vaudeville act of Sharon Neumann Solow and her husband Larry Solow starred in the 40-episode series “Say It With Sign,” which ran for two years on the NBC owned and operated stations across the country, and was written and produced by Silent Network founders Sheldon I. Altfeld and Kathleen Gold. The series taught basic sign language and received the first of a dozen Emmy nominations the Network ultimately received. 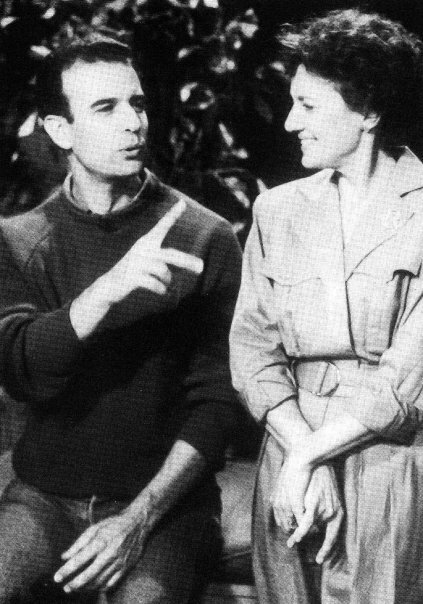 Actor Robert Walden (“Lou Grant”), hosts a unique look into the lives of a deaf couple with a hearing daughter who was heading off to college, leaving the couple without their “ears” for the first time. Titled: “A World of Quiet,” the special aired on ABC. 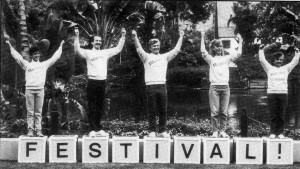 One of the most popular TV shows on The Silent Network was “FESTIVAL” featuring (from left) Terrylene, Robert Daniels, Ed Waterstreet, Julianna Fjeld, and Fran Ripplinger. The series was one of the only productions allowed to shoot on the grounds of the Self Realization Fellowship’s Lake Shrine in Pacific Palisades, CA. 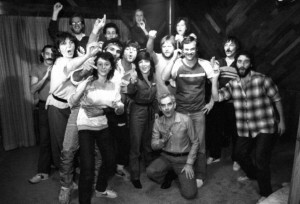 Following a marathon shoot (Forty-six half-hour productions completed in six days), the crew spelled out “OK FINE” in sign language. 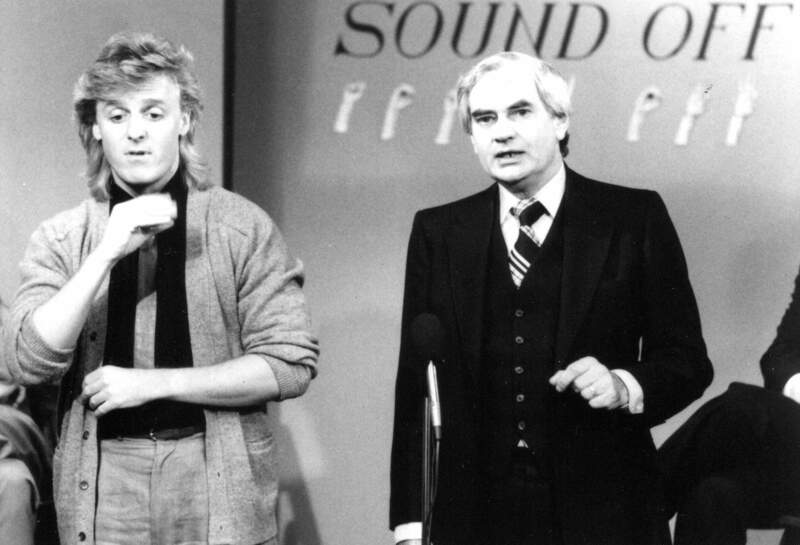 The ultra-talented actor-interpreter Bill Pugin serves as interpreter as Silent Network founder, Sheldon I. Altfeld, introduces “Sound-Off,” a one-hour special devoted to the controversy of the Cochlear Implant. David Pierce, a graduate of the National Technical Institute for the Deaf, started in the Silent Network library counting videotapes and ultimately became Vice President of Production and Network Operations — a job he held until 2000. (Note that this is one of the extremely rare photos of David not wearing his signature hat). 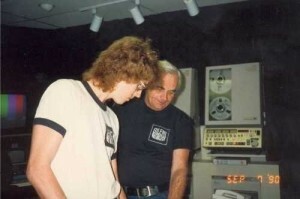 Also, this photo was taken at the fabulous Maverick Video Productions studio in San Antonio, TX., where the network moved from LA to San Antonio after it was sold in 1990. Without the gang at Maverick, there would have been no production, no accolades, no awards, no fun whatsoever. Sheldon I. Altfeld, the Network’s founder, was hired to produce and direct the initial programming for the new owners and with the help of David Pierce, managed to crank out more than 200 half-hour programs in less than a year. Producer-Director David Butterfield, with interpreter Cath Richardson Kiwitt, addresses the audience prior to production of the one-hour special, “Sound-Off,” which explored the controversy in the deaf community of the Cochlear Implant. Butterfield was an early recipient of the Implant. 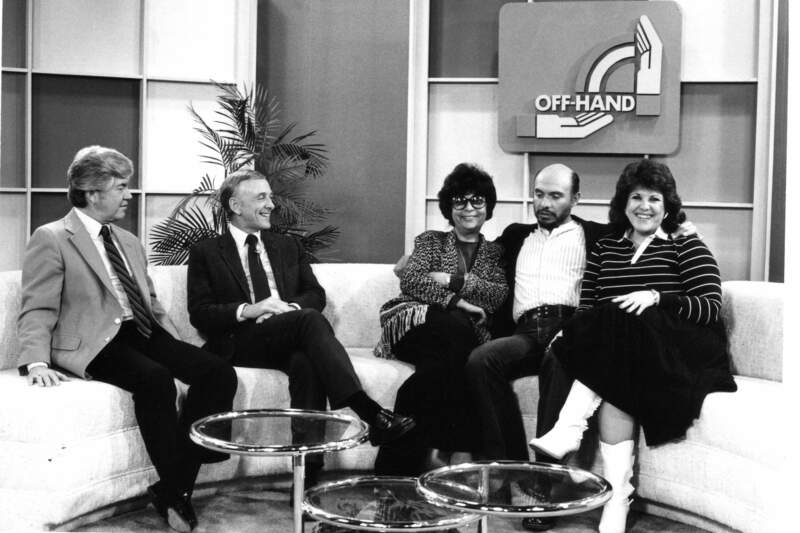 Host Herb Larson (from left); co-host & interpreter, the late Lou Fant, Associate Producer, Dorothy Sinclair; award-winning actor Hector Elizondo; and talent manager Vickie Arthur on an episode of “Off-Hand.” The half-hour talk-show ran from 1981 through 1989 on KHJ-TV, Channel 9, in Los Angeles and produced 385 episodes with more than 500 guests. A brief list of celebrities appearing on the show, in addition to Elizondo, included Nanette Fabray, Lorne Greene, Marlee Matlin, Louise Fletcher, Shirley Jones, Tom Bosley, Phyllis Frelich, Earl Holliman, Joanne Worley and Elvira (Mistress of the Dark).